In order to counteract the constant tension that a contracted muscle is doing, you need to stretch the muscle. The recommendation is that you stretch your closing muscles by using the "N stretch." This is accomplished by saying the letter "N," and then stretching upon your jaw but keep your tongue in the N position so that it is right behind your top front teeth. 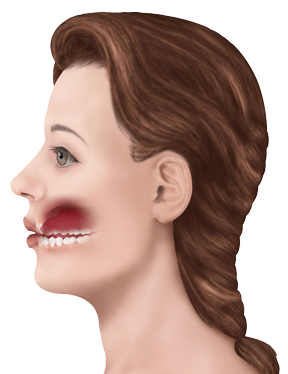 This will limit your opening to protect your jaw joint, or TMJ. Hold this for 6 seconds, rest, repeat this 5 more times, and the total time will take only one minute. The image to the right is timed at exactly six seconds so you can gauge how long you are holding your stretch using the animated image. It is recommend you do this 6 times a day as well as any time you catch yourself clenching your teeth during the day. After all, if you are clenching, the muscle is contracted, and to help the muscle, you need to stretch it.